MSIL is known for producing budget friendly vehicles in Indian automobile market. 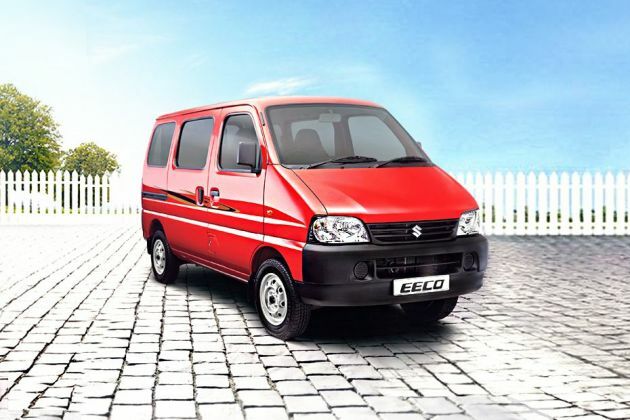 One such model is the Eeco MUV, which comes with a length of under 4-meters. This vehicle is powered by a 1.2-litre petrol mill that has a 32-bit engine management system. It comes in numerous variants among which, Maruti Eeco CNG 5 Seater AC is one of the top end trim. This variant has a factory fitted CNG fuel kit that helps in improving its fuel efficiency. It has features like an air conditioning system, reclining front seats, rack and pinion based power steering and an instrument panel with amber illumination color. This vehicle has an attractive external appearance is quite trendy as it is decorated with contemporary body decals. At the same time, its interiors are done up with elegant dual tone color scheme that contemplates its smart exteriors. This vehicle can provide seating for at least five passengers and provides 510-litres of huge boot storage space. This vehicle competes with the likes of Tata Venture in the entry level MPV segment. On the other hand, it comes with a standard warranty of 2-years or 40,000 kilometers, which can be extended for three years or 60,000 kilometers. This compact MUV has a contemporary exterior design that is elegantly decorated with stylish body decals. Although, it has a boxy structure, it looks quite attractive owing to its trendy cosmetics. Its front facade has a black colored bumper designed with a smaller air intake section. The radiator grille has horizontally positioned black bars that are further engraved with 'S' badge. Surrounding this is the large headlight cluster, which is powered by a halogen based headlamps and turn indicators. The front windscreen is quite large and is accompanied by a pair of wipers and a small bonnet. All the pillars are painted in body color, while the door handles and ORVMs are black. Apart from these, there is a small turn blinker placed above the front wheel arch, which adds to the safety. Its rear profile looks as attractive as its front facade, thanks to the black bumper and neatly crafted taillight cluster. The tailgate is equipped with a large windscreen and is decorated with chrome inserts. Furthermore, it houses a license plate console and a black colored strip. This vehicle is available with six exterior paint options including Blue, Red, Silver, Grey, White and Black. The main highlight of this Maruti Eeco CNG 5 Seater AC trim is its internal cabin, which is extremely spacious. This vehicle comes with a large wheelbase of 2350mm along with an impressive height of 1800mm, which explains about the leg and shoulder space inside. This MUV can host seating for five passengers with 2+3 seating arrangement. Both the front seats have integrated head rests and reclining function wherein the driver's seat also has sliding function. Its insides are done up with beige and black color scheme that gives a plush appeal to the cabin. The dashboard has a dual tone color scheme and is equipped with aspects like a powerful AC unit, an instrument panel, storage box and a music system. There are quite a few utility aspects provided inside like sun visors, inside rear view mirror, two-spoke steering wheel, and door grab handles. This trim has an impressive 40 litre fuel tank and a boot storage space of about 510 litres. This multi-utility vehicle is powered by a 1.2-litre petrol power plant that is incorporated with an engine management system. It features high pressure fuel injectors, knock sensors, and low friction pistons, which provides better fuel efficiency and performance. This motor comprises 4-valves and 16-cylinders that receives fuel through multi-point fuel injection system. Although, it is fitted to a CNG fuel kit, it produces a maximum power of 73bhp at 6000rpm and generates a peak torque output of 101Nm at 3000rpm. This engine is coupled with an advanced 5-speed manual transmission gearbox that is incorporated with diagonal shift assistance, which provides smoother gear shift. This CNG variant has the ability to produce a decent mileage of approximately 16 Kmpl (on city roads), while delivering a maximum of 20 Kmpl (on highways). This vehicle is blessed with a proficient braking mechanism, wherein its rear wheels are fitted with reliable drum brakes. At the same time, its front wheels have been equipped with ventilated disc brakes that works fine in all weather conditions. The car maker has also integrated a robust suspension system in the from of McPherson strut on its front axle and 3-link rigid mechanism for its rear axle. On the other hand, the company has installed a maintenance free rack and pinion based steering system that supports a minimum turning radius of 4.5-meters. This Maruti Eeco CNG 5 Seater AC is one of the top end variant, but it still gets some standard comfort features. Its dashboard has been fitted with a powerful air conditioning system including a heater and roof mounted vents for rear cabin. This trim is also fitted with an instrument cluster that has a speedometer, multi-trip meter, odometer and fuel level indicator. In addition to these, there is an a 1-DIN audio system incorporated to the central console that keeps the passenger entertained throughout the journey. Apart from these, it gets a few utility aspects like two front sun visors , external and internal rear view mirrors, sliding driver's seat, integrated head restraints (front seats) and front intermittent wipers. It has a rigid body structure featuring side impact bars, crumple zones and energy absorbing materials, which minimizes the damage caused in case of a collision. This MUV comes with high seating positioning that provides better visibility for the driver and thereby adds to the safety levels. In addition to these, there are features like headlamp leveling, child lock for doors and windows, seat belts for all seats and high mount stop lamp. 1. Mechanism of diagonal shift assistance (DSA) is good. 2. Fuel economy is rather impressive. 1. Very poor interior and exterior appearance. 2. Limited comfort features are a disappointment.